Even if you haven't seen Thor: Ragnarok yet, you've likely seen the trailer where the villainous Hela (Cate Blanchett) destroys Thor's hammer Mjolnir, leaving many to wonder what the Asgardian warrior will be wielding in Infinity War. 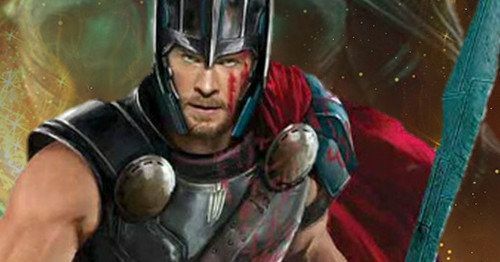 A report from May hinted that Mjolnir will find a way to return to the mighty warrior, but if leaked images from an upcoming Avengers: Infinity War LEGO set are authentic, then Thor is wielding a new weapon, one comic book fans are familiar with. These leaked images show Thor and a weapon he's used in the Marvel Comics before, his mighty axe known as Jarnbjorn. There had previously been a LEGO set from Infinity War leaked that was entitled "The Search For Thor's Weapon," which included mini-figures of Thor (Chris Hemsworth), Rocket Racooon (Bradley Cooper), Groot and an unspecified Infinity Stone, which seems to tie into the scene shown in the Infinity War trailer, where Thor meets the Guardians of the Galaxy for the first time. While the actual weapon wasn't revealed then, a new photo has leaked which shows the weapon is clearly Jarnbjorn, although there has been no indication yet that this weapon will actually be used in the film itself. Despite a lack of confirmation from Marvel, this makes sense, although in the Marvel Comics, Thor wielded this axe Jarnbjorn long before he wielded Mjolnir. Thor built Jarnbjorn in the 9th Century, after failing to lift Mjolnir after many, many attempts. He used this weapon to fight a number of different enemies on Earth, such as Frost Giants, trolls and dragons. He even used this weapon to square off against Apocalypse in the 11th Century, although at some point, Thor eventually lost Jarnbjorn, with Kang the Conqueror eventually recovering the axe in Baron Mordo's tomb in Brazil. The axe was then stolen by the Apocalypse Twins, although it ultimately ended up back with Thor, where he used it to defeat Malekith. The axe is said to be sharper than any weapon forged on Earth, and can cut through virtually anything that comes in its path. Thor also modified Jarnbjorn so it could pierce Celestial armor, although it remains to be seen if any of these attributes will carry over to the movie, if Thor does use this axe in the movie. Given how Mjolnir has been destroyed, Thor's use of Jarnbjorn does make sense, although how he obtains this axe in the Infinity War movie remains to be seen. While leaked toy photos can often reveal accurate details about an upcoming movie, they can also sometimes be misleading, so it's important to take this news of Jarnbjorn's inclusion in Avengers: Infinity War with a grain of salt. Since we know Thor meets the Guardians of the Galaxy in Infinity War, one possibility is that Thor could tell his new friends about how he lost his hammer, which could lead to the Guardians taking them to The Collector, who may just have Jarnbjorn in his collection, but that has yet to be confirmed. Take a look at the LEGO image below, which was unearthed by Super Bro Movies.